Our Platform No. 2 antimicrobials can be incorporated into many polymers. Our antimicrobials uses are broadly applicable across medical, consumer and industrial markets. A wide variety of derivatives can be synthesized. Ion exchange resin can be loaded with active cations (metals and organic active cations) to yield an antimicrobial ion-exchange resin (AMIEs). These AMIEs are milled to size-controlled powders. Several derivatives have been synthesized to date, including Copper (Cu++), Silver (Ag+) and Quaternary Ammonium Compounds (QACs). These powdered biocides are added directly to synthetics and natural polymers. Our antimicrobials are readily processed into polymeric materials generating a self-disinfecting, non-toxic surface. These materials are extensively bactericidal and fungicidal and eradicate 99.99% of pathogens. 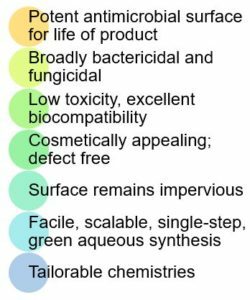 Their surfaces remain antimicrobial for the life of the product. In recent years interest in silver nanoparticles (Ag NPs) has increased due to their unique antimicrobial activities. Silver nanoparticles are the most common commercialized nano technological product on the market. They are widely used in many products including advanced wound dressings. However, there is an increasing concern related to the biological impact of the use of Ag NPs on a larger global scale, and the possible risks to both human health and their environment. Our antimicrobials are not nanoparticles. Our antimicrobials are organometallic polymer microparticles that are much less toxic than nanoparticles. 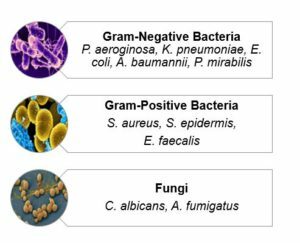 These biocides are highly effective against a range of drug-resistant gram-positive and gram-negative bacteria and fungi. Our antimicrobials can be incorporated into many products, including catheters, wound dressings, medical tubing, implantable devices, tracheostomy devices, decorative and marine paints, flooring and textiles.